Week’s best Apple deals: The accessories edition! Grab some hot deals on Apple accessories. 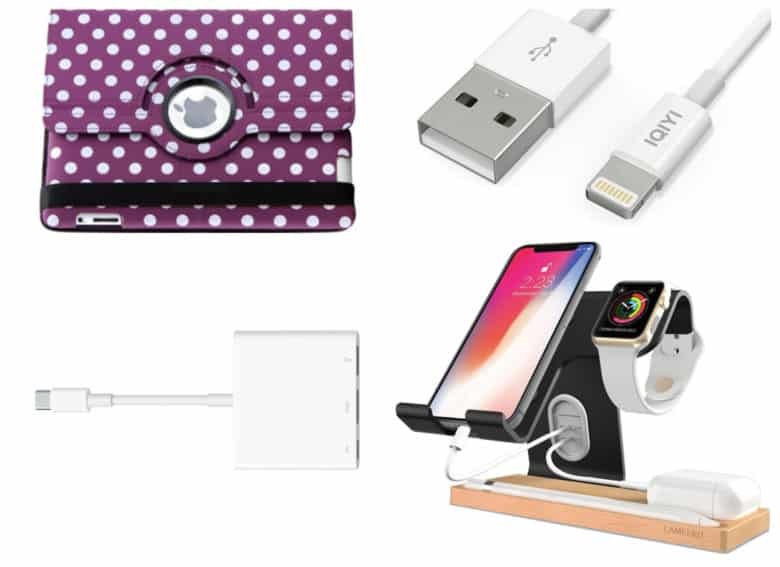 This week, you will see great deals on essential Apple accessories including Multiport Adapters, iPad covers and charging stands. Plus, get the lowest price on an unlocked iPhone 7! If you’re looking to mirror your Mac display to your TV, L.A. Computer Company has the Apple USB-C Digital AV Multiport Adapter for $59 with free shipping. That’s the lowest price we could find by $5. It supports video resolutions up to 3840×2160 (4K) and features USB Type-A, HDMI and USB-C power passthrough ports. One of the most popular iPad covers is at such a great price that you can afford more than one color! Drhotdeal via eBay offers this iPad Rotating Magnetic Cover for $6 with free shipping. That’s $4 under the lowest price we could find for a similar case elsewhere. The case comes in several colors like black, green, hot pink, red and yellow, plus some eye-popping patterns. It features a polycarbonate back and faux-suede interior lining. It’s compatible with the iPad 2, 3 and 4. One way to eliminate the plethora of wires and cables for your electronics is to consider a charging stand. Lameeku-US via Amazon offers its Lameeku Apple Watch/iPhone Charging Stand in black or silver for $19.99. Use coupon code “LAMEEKU5” to drop the price to $10. Plus, Amazon Prime members receive free shipping. That’s the lowest price we could find by $20. The charging stand is compatible with 38mm and 42mm Apple Watches and features space for an Apple Pencil and AirPods. This deal ends May 31. And, if you aren’t looking to eliminate wires and cables from your life, we have a deal for you, too. OOKi Electronics via Amazon has the IQIYI 3.3-Foot MFi-certified USB 2.0-to-Lightning charger cable for $7.99. Use coupon code “KZYLUD8Y” to drop that to $4. With free shipping for Prime members, that’s $4 off and the best price we could find. This deal ends June 30. If you’re not in the market for accessories, but do need a new phone, consider a refurb! MyWit via eBay offers the refurbished unlocked iPhone 7 32GB GSM smartphone in rose gold for $300 with free shipping. That’s $38 under our March mention and the lowest price we could find for a refurb by $25 today.